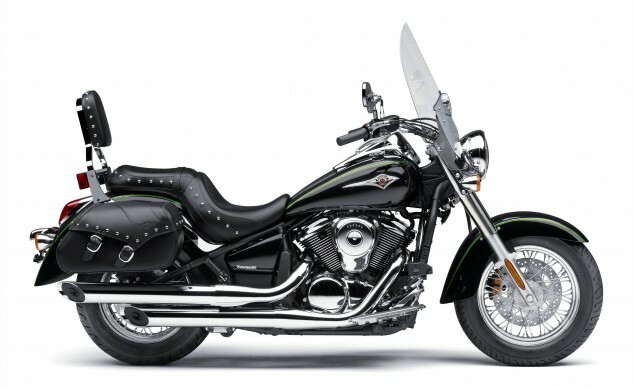 Today Kawasaki released the list of its not-particularly-updated but available in 2015 returning models in the Vulcan line. The big news of these announcements is that the two 1700 Vulcans received a $2,000 price reduction from last year. That’s right, a price reduction. With three Vulcan 900 models slated for next year, all updates these Vulcans received were in the paint choices. 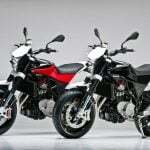 Still, for those who are considering one of these cruisers, the new color choices may be what is needed to get you off the couch and into the local Kawasaki dealership – once the bikes are available. The cream of the Vulcan touring crop comes, again, in the form of the Vulcan 1700 Voyager ABS. 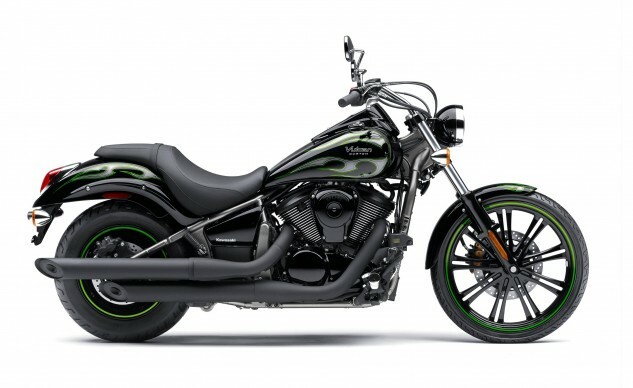 Back for another year, the beefy 1,700 cc V-twin engine grinds out the power it creates through a 6-speed transmission. Mounted to touring-focused frame, the fairing delivers the kind of weather protection touring riders expect. 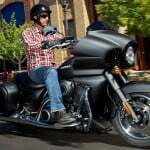 The top-opening saddlebags are weatherproof and lockable. The rider and passenger accommodations are designed for the long haul. Coupled with Kawasaki’s K-ACT II ABS braking system for safety plus cruise control, a Garmin Sumo 600/665 GPS, and an AM/FM/WB audio system with iPod input and SiriusXM radio, the Voyager has the credentials to get you to your destination in style. For 2015, the color combination of Metallic Carbon Gray / Metallic Spark Black as the sole choice. 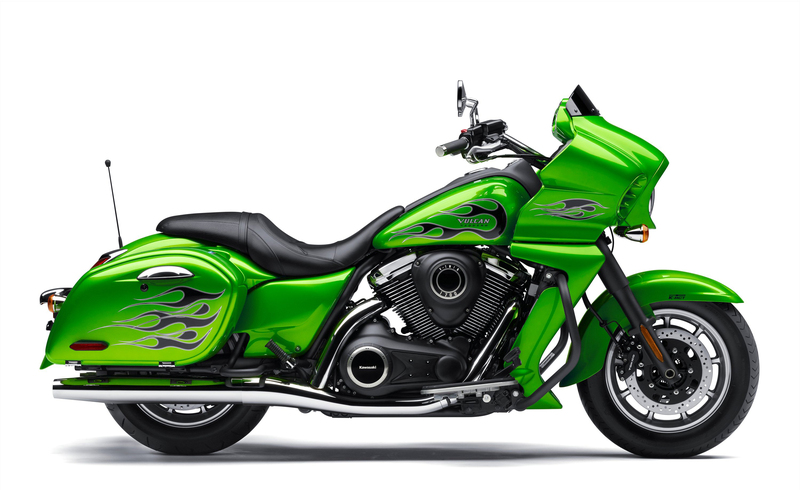 However, the MSRP drops $2,000 to $17,399 and still included Kawasaki’s 36-month warranty. 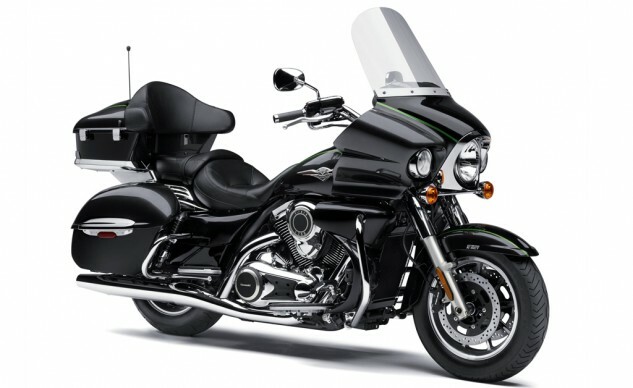 The Vulcan 1700 Vaquero is for riders who want touring comfort without all the touring baggage. Yes, it still has a frame-mounted fairing, but the lowers are abbreviated. The saddlebags open to the side for a more svelte look. 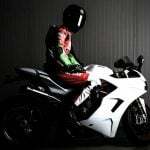 No trunk hinders the lines from the top of the dark, abbreviated windshield to the tip of the rear fender. Of course, the 1,700 cc V-twin still provides the Vaquero’s motivation. You also get the same stereo as the Voyager. The Vaquero’s characteristic attitude comes courtesy of blacked out components instead of the usual chrome. 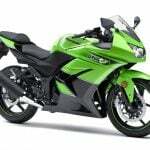 The 2015 color choices are: Candy Lime Green with Ebony frame graphic and Metallic Carbon Gray with black racing stripe. Perhaps the best update for the new model year is the $2,000 price drop to $16,699. What’s in a name? 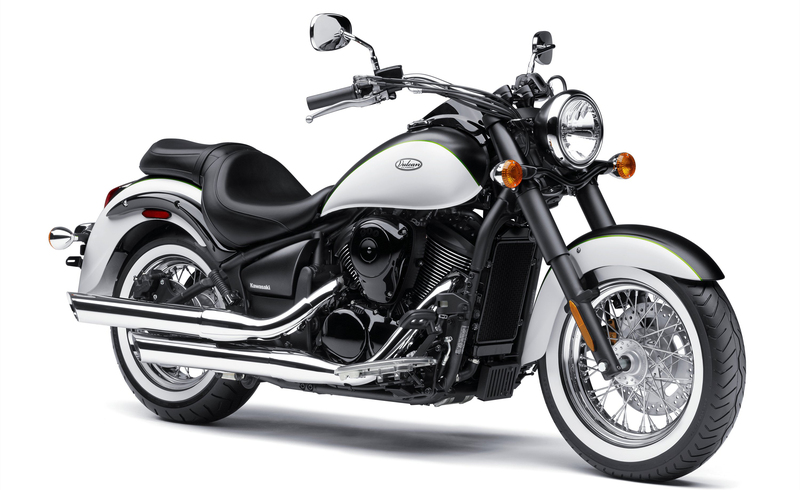 Well, the 2015 Vulcan 900 Classic delivers exactly what one would expect from a 903 cc V-twin powered cruiser. As the name implies, the styling is classic from the white walled tires and spoked wheels to the skirted fenders. What hasn’t changed for 2015 is the Digital Fuel Injection engine’s power and economy. Additionally, the rider and passenger accommodations are quite comfy. Price remains unchanged at $7,999, and the 2015 two-tone color combination is Metallic Matte Carbon Gray Pearl / Pearl Flat Crystal White. If you like the lines of the Classic but plan on light touring duty from your cruiser, the 2015 Vulcan 900 Classic LT will fit the bill nicely. 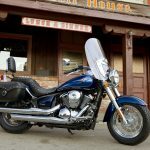 Taking the same platform as the 900 Classic, Kawasaki added a cop-style windshield, a studded seat for rider and pillion, a passenger backrest, and leather saddlebags. The low-maintenance belt-driven cruiser receives its own two-tone paint scheme, aptly named Metallic Carbon Gray / Metallic Spark Black. Would you be surprised to learn that a bike with a gray on black paint scheme doesn’t have white walls? We weren’t. Pricing will be $8,999. For Vulcan 900 riders whose character leans more towards attitude than classic, the 2015 Vulcan 900 Custom has been announced. 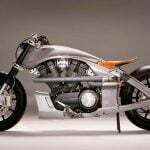 Utilizing the same 903 cc engine as the rest of the Vulcan 900 line, the Custom will deliver sportiness along with economy and reliability. No, those aren’t mutually exclusive. The attitude stems from the Custom’s 18-spoke, 21-inch cast aluminum front wheel and its minimalistic fender. The 15-inch rear wheel wears 180/70×15 rubber and the same black coating plus a green stripe around the rim. The $8,499 price tag gets you this cool V-twin in Ebony.